The Wilma XL 8-pot System is an extremely versatile hydroponic system that can be used with many different growing medium. The main Wilma kits available offer pot based dripper systems with sizes ranging from 4 pots to 20 pots. 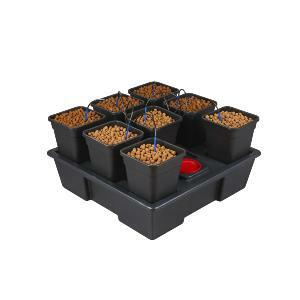 They are, especially suitable for growing in clay pebbles, rockwool grow cubes or organic growing media such as soil or coir. As a part of the incredible Atami growing range these systems offer hydroponic feeding possibilities to all growers including those who traditionally grow only in pots. Pots are placed on a tray above a nutrient solution tank. Plants and drippers are placed in the pots with the chosen growing medium. Set the irrigation frequency with a timer, which triggers the drippers to automatically feed the plants. The nutrient solution trickles through the growing media, refreshing the nutrient around the roots and pushing the older nutrient out of the bottom of the pot and into the catchment tank. Each system is supplied with both flood drippers and arrow drippers to allow the grower complete freedom in their choice of growing medium.